Well it seems that after all of the talk by many about doing a documentary or film on Halston, someone has finally followed though!! 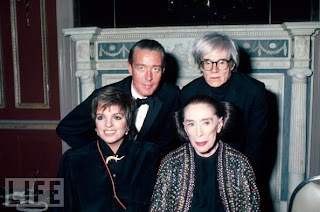 A documentary entitled "Ultrasuede: in Search of Halston", was shown at the Tribeca Film Festival in NYC. Celebrities, friends and models like Liza and Pat Cleveland all were filmed giving insight into his accomplishments in fashion and personal life. I'm hoping and praying that the film will be put on a dvd so that his legions of devoted friends will have access to it!! I know I'll be on the lookout for it! I also discovered at the You Tube website that there are 34 video clips on various subjects and celebrities from film footage and interviews the late Andy Warhol did with various famous people. Much to my absolute delight, there were four clips on Halston! Anyone who is a fan must see them!! He appears discussing his business and fashion philosophy and there are scenes from his couture and ready to wear collections. To see Pat Cleveland working that Olympic Tower runway will firmly establish in anyone's mind why she has been called the "greatest runway model in fashion history"! I was sliding out of my seat as I watched Ms. Cleveland and the other Halstonettes define what is real modeling....drama and elegance combined!! They swirled and worked the skirts of those totally fabulous bias cut gowns....many of them made from a single piece of fabric!! To this day there is no other American designer making clothes of that calibre and innovation! One can easily see why he has been called the "ultimate American designer", and why sadly there will never be another like him!